Planning to spend: One of my goals/ plans for March was to have zero personal spending. I’ve already slipped up but, at £2.92, the world hasn’t ended as yet. other than that I’ve been really good at not spending anything and having set it out as a goal it has been a good reminder to just wait sometimes. I decided to start a list of the things I want to spend on and to have a shopping/spending day on the 1st of April. I’ve already decided I didn’t need one of the things on my list and the book I wanted is now not available until the end of April anyway. My list now only has one thing on it – the heat protector I use on my hair which has almost run out. I’d also quite like a new book for my Kindle as this is perfect for keeping my eyes open during night feeds! The list will also probably include something relating to the next on my list which is…. Wearing rags: Ok, I’m not exactly wearing rags but…very few things fit me at the moment. And I mean very few. I’m not mentioning sizes here because it is very easy to cause offence and that’s not what this blog is about. Pre-pregnancy number one I was pretty happy with my size. Half a stone less would always have been welcome but I was really quite happy with where I was at! by the time I found out I was pregnant a second time I was a stone heavier than the start of my first pregnancy and dress size larger. I’m not back into even the larger of the two sizes yet, but the maternity stuff looks all wrong. It is tempting – very tempting – to go out and buy some things in a larger size still, just to have more things to wear and not the worn out stuff I’m throwing on every day. HOWEVER, the weight is coming off at around 1 to 2 pounds a week and it seems daft to spend money on clothes when – hopefully! – they won’t fit in a month or so. Plus I think it would also make it easy to just stay at this size. My entire wardrobe consists of two pairs of stretchy black trousers, 1 T-shirt, one long sleeved black top, a black jumper and a few cardigans. Oh, and a purple jumper from ‘before’ that is ok for around the house but not for public viewing! I am soooo tempted to buy something new just to break up the monotony. I saw a pinkish jumper in a tesco for £8 and so nearly bought one. It has gone now – typical. Anyway, the road to my previous size is still going to be a fairly long one so I’ve decided that I am going to give myself a £20 budget to buy a couple of cheapy bits on the 1st of April when I should have lost a bit more weight. I am on track to lose the 8 pounds I set for my March goal so I’ll try on a few sizes and see what fits best. More budget eating! : And, yes, more recipes from A Girl Called Jack. I made the peach and chickpea curry which was so good it was worth buying the book just for that recipe! And I don’t even like curry! Husband and I don’t like any hot or spicy food at all though we both wish we did because we know we’re missing out on so many dishes. It’s a round peg, square hole situation. I just left out the chilli though and the curry was still really tasty with just the cumin and coriander (I used dried instead of fresh). Plus I made the peanut butter and jam thumbprint cookies again. Nom nom. Whenever I’ve bought recipe books in the past I always envisage myself cooking the whole book. What actually happens is that I find one or two recipes I like and then the rest require too much faffing or daft ingredients. This is the first recipe book I’ve bought where I really think I might cook the whole thing. PLUS I trust Jack Monroe enough that I’ll have a go at cooking and eating outside of my comfort zone. I can’t imagine anyone reading hasn’t heard of her but just in case you haven’t, read more from Jack at http://www.agirlcalledjack.com . Making a two week meal plan and cutting down on deliveries: I am finally, FINALLY getting over my post op infection so I’m going to cut back from having the food delivered every week to every other week. I should be able to manage the bags from a smaller shop on the weeks in between (our parking space and garage is up the road from our house, not on the property itself so while it is great that I have a car it is still a bit of a faff, especially with two kiddos). I decided to make a meal plan (main meals only) for two weeks so I could buy all of the meat and fish ( for the freezer) and store cupboard stuff (from tinned goods to loo roll) in one go. Theoretically I will only need to buy fresh bits to supplement what I’ve already bought. This should save around £10 in delivery fees over the next month. I’ll post more about the menu plans another day. So that’s me all up to date. My girl is at pre-school all day today and baby is napping so I’m going to make myself a hot honey and lemon and curl up with my kindle book about the Mitfords who I find endlessly fascinating. Happy Thursday everyone! Budget friendly cooking : I’ve tried out two more budget friendly recipes from A Girl Called Jack. The bean burgers were something totally new for me which was great as I feel like I need to get out of my cooking comfort zone. 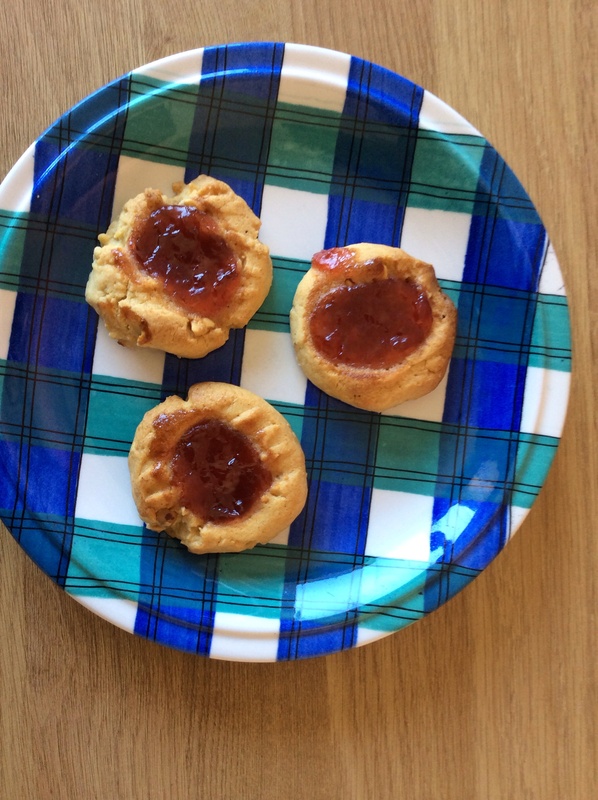 I also made the peanut butter and jam thumbprint cookies shown above. my daughter helped with the making of both and really enjoyed getting her hands messy! I like this sort of time in the kitchen as I think it makes a necessary chore into a bit of entertainment. Eating odds and ends: Instead of doing a shop for the weekend we used up the last few things in the fridge and also a fe bits fork the freezer and the store cupboard. Obviously this saved some money! Doing things for free or on a very small budget : we visited friends yesterday afternoon and then my daughter had a friend over for tea. We also took her down to the beach and bought her an ice cream as well as arranging a play date in the local park. Yup, I’ve gone and got my first ever credit card. I never did the whole credit card thing though my husband did and it took years to pay off. I had to pay off one and one actually got paid off by the mortgage so I suppose we’re technically still carrying the debt. Anyway, I’ve always been a bit uncomfortable with the idea of making big purchases with my debit card as you don’t get the same protection but I was always more uncomfortable with the idea that I could get sucked into debt vortex and never come out. However, in the new year I decided it was time to take the plunge. Tesco Offer a credit card where you get extra clubcard points when you shop with them and you can even earn points when you use it in other shops. I am planning to save my clubcard points up for the whole year year and then spend them at Christmas. You can usually double your points when you spend them on toys just before Christmas which will be a real help as I will only just be back at work by then. I got my first statement today and am off to the bank to pay it in. I’ve also got to pay in a couple of cheques (one of which I had forgotten about – yay!). 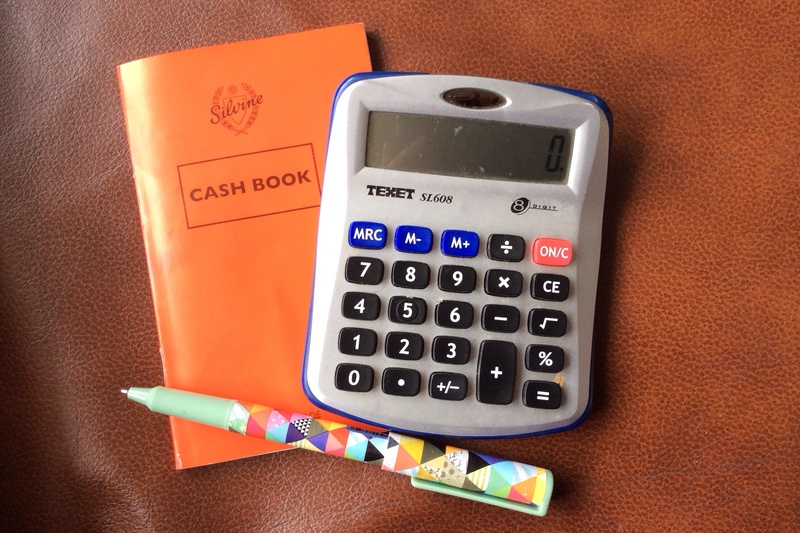 My highly technical financial planning system consists of an old-school cash book, a pen and calculator! No fancy spreadsheets in this house! I reserve a page for keeping track of what purchases I have made on the credit card to make sure I am allocating the correct amount in order to pay it off in full as soon as the statement arrives. I also keep track of all spending on my debit card though, since I get more Clubcard points the more I use the credit card I can see myself using the debit card much less often. Tesco know how to reel you in don’t they! My little girl is at pre-school today and baby has been having a marathon nap, hence I’ve had time to sort out the above as well as put all of the dry laundry away and the damp laundry scattered through the house on various radiators. I’ll leave a bit early to pick her up so I can go into town and get the banking sorted. I haven’t got to go to any shops at all so it will be another No Spending Day. Right, I’m off to go and find a baby to cuddle. I peeled, boiled and mashed a batch of potatoes earlier. I find mash freezes really well and it saves time (both in terms of cooking and cleaning up) to have it ready made. It also saves the spuds from going off before I get chance to use up a large bagful. I then started to sort out the pantry which has become something of a dumping ground for odds and ends. It needs a bit more work but I ran out of time as we had family over to meet the baby. Still, I find anything like batch cooking and sorting out supplies helps me stay on budget. It’s been another low key non-spending day. 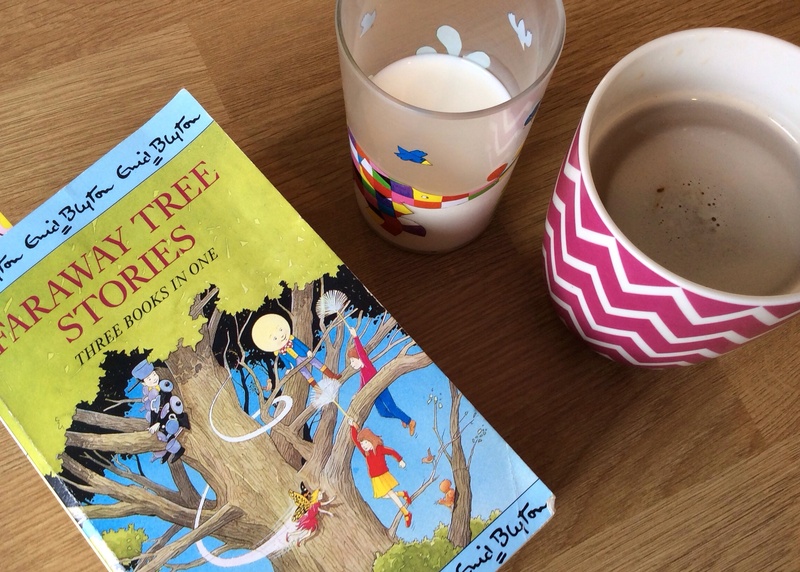 I managed to find a little quite time earlier to spend reading one of my favourite childhood books to my daughter. She’s just started to get interested in chapter books so I’ve been having great fun dusting off the books I’d kept for that elusive ‘one day’ when I had children. And now it’s here! Luckily for us we’ve been given a huge amount of used baby clothes. As some of his 0-3 month clothing is getting a bit too small I started sorting through the bags of larger clothes to see what we’ve got. All of the 3-6 month stuff has now been washed, dried and folded away in the bottom drawer so it is ready when he needs it in a few weeks time. Based on the sort out I now have a much better idea of what I need to buy for him, namely long and short sleeved body suits plus a couple of short sleeved T-shirts. Getting organised about this stuff saves wasting money on things you don’t need and making sure you have some budget left for the things you do. The ‘new’ clothes are now packed away, ready and waiting in the drawers above. 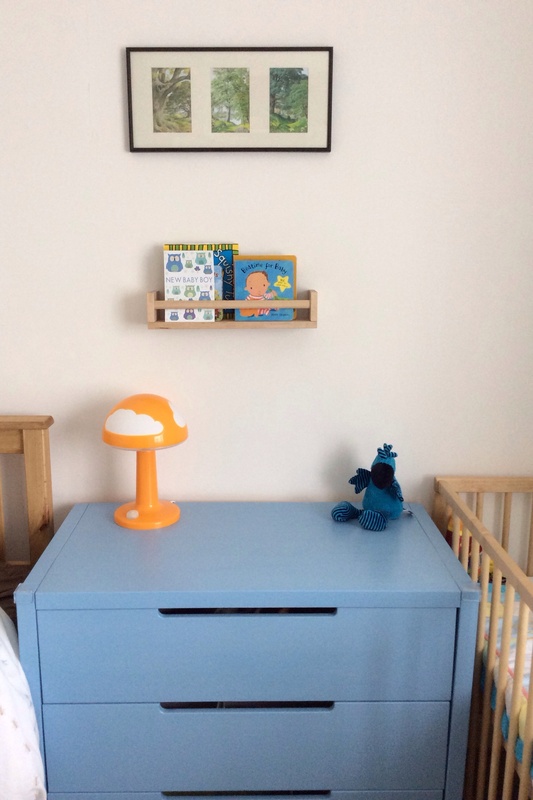 This is a chest of drawers we used to have in our bedroom which husband painted ready for baby’s arrival. 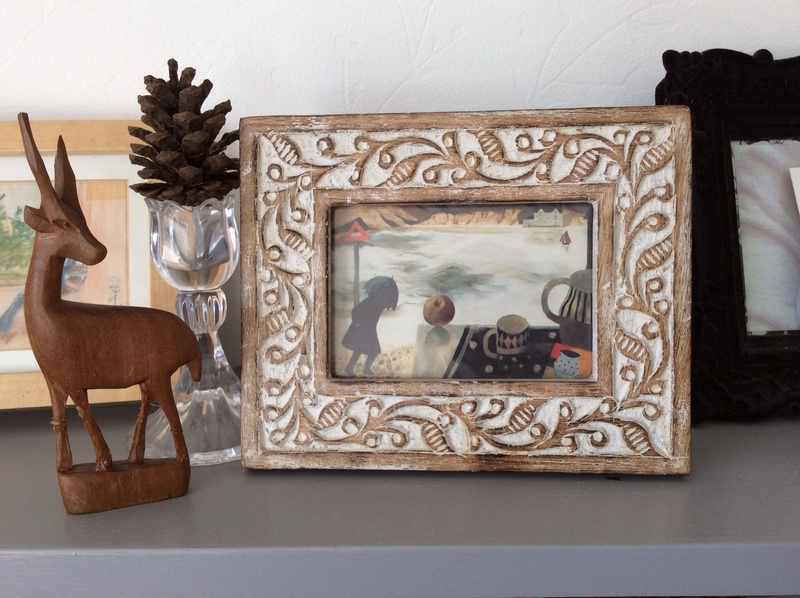 Also in the photo you can see the IKEA spice rack we’ve used as a little book shelf. The pictures are taken from an old Ladybird book about trees. I found the book in a charity shop a couple of years ago and bought it because I loved the illustrations – probably because they remind me of reading ladybird books as a child. Anyway I used the photocopier at work ( probably breaking a hundred copyright laws in the process – sorry!) to take copies of my favourite three pages and repurposed the frame from elsewhere in the house, thus the framed prints only cost 3p for personal use of the office photocopier. Husband painted a huge mural taking up an entire wall in our little girls room but we’re going to wait until baby boy is a bit older to see what he’d like before doing anything too dramatic in his room! So, today’s challenge has been met by organising the free clothes we’ve been given and making a realistic plan for what we actually need to buy! Baby boy is nearly 9 weeks old and, since I’ve had various set backs following my caesarean, finding any sort of routine has been something of a slow process. However, we do seem to be settling into a very laid back version of a routine. Baby was asleep again by 9 o’clock so I decided to use the opportunity to do some baking with my little girl. 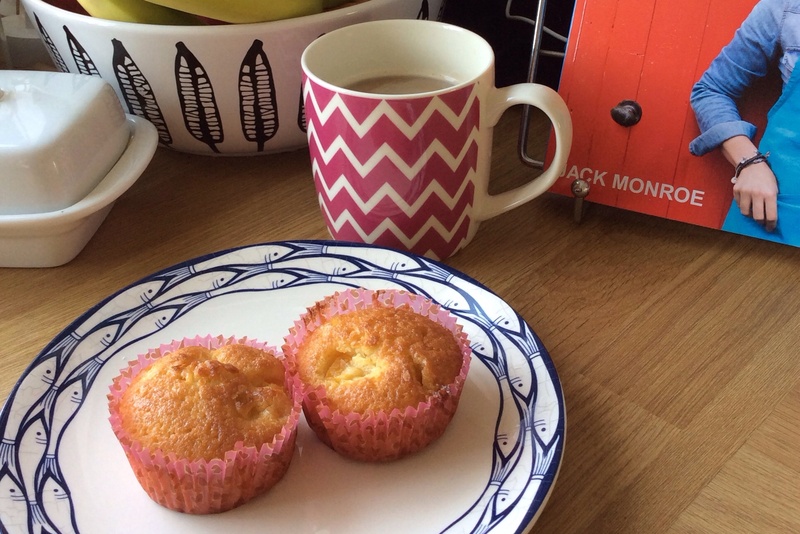 We made peach and white chocolate muffins. The recipe was from the fabulous new book ‘A Girl Called Jack’. I had never been so excited to buy a cookery book as I was to buy this one! It is actually supposed to be a traybake but I didn’t have the right sized tray so had to improvise and just cut the baking time. I already had the ingredients (I had picked up a 30p bar of tesco value chocolate in anticipation of making this recipe) so I didn’t have to spend any money today. Plus I let my little girl have a go at cracking the eggs and she was so proud of herself for not getting any bits of shell in the mixture. We took some to share with my Mum and Gran, after sampling – er – more than one and then froze the rest (it made 18 muffins if you’re interested). Nom. So, this was the sweet start to the 100 day challenge: visiting relatives and baking cakes using things I already had (ingredients and petrol!). The 100 day challenge – take 2!! Not long after I started this blog (5 years ago this month believe it or not) I decided to embark upon a 100 day challenge. It seemed quite a long stretch at just over 3 months but it was a good way of establishing a certain kind of discipline in being a more considered and moderate consumer. I’m never going to go off grid or become deeply frugal out of choice (and hopefully never out of necessity) but I think I would benefit from having another go at it. Five years down the line we are on a much smaller income and yet we have a much bigger mortgage and two children to support. To be earning so much less after such a long time might seem somewhat backward and yet I think it is just a sign of the times. I don’t currently have any very specific financial goals – I’m not saving up for anything or trying to pay anything off – I’m just trying to live off what we’ve got, have some funds put to one side for emergencies and have a bit of fun along the way. Let the shoestring fun begin! Well we’ve managed a very full weekend for next to nothing. Yesterday a friend and her little boy came over for coffee in the morning which turned into a whole day affair. I managed to scratch lunch together for everyone out of the last few bits in the fridge and cupboard (pasta and mushrooms in a home-made cheese sauce). The kids had fun running around and when they got a bit stir crazy we took them off to the park. My friend treated them to an ice cream on the seafront (kids don’t seem to notice how cold it is when there is ice cream involved!) as we had done lunch. Husband and I watched something on Lovefilm Instant in the evening which we’ll probably do tonight provided baby hoy settles – I’m currently obsessed with the TV series Blue Bloods. Today we had some other friends over for lunch with more kiddos tearing around the place like mini tornados. I confess I am quite knackered after hosting two days in a row so I’m hoping for a chilled out morning tomorrow. Well, as chilled out as it can get with a newborn and a 3 year old! The only spending we had to do this weekend was to buy a few bits to make lunch today (we would have to have bought something anyway as the cupboards are bare) and we’ve seen lots of friends which has been great. Hopefully I’m on a roll! No personal spending on stuff. Not even virtual spending, like downloading books on my Kindle. No, no, no. But yes to moderate spending like going out for a coffee with the other Mums etc as this is good low cost socialising for the whole family in my book. get through all of the medical appointments. We’ve got two 60 mile round trips for baby boy to have a hip scan (he seems fine but there is a family history so they are checking just to be on the safe side) and again for him to attend the jaundice clinic to check everything is ok. I’m doing my best not to get paranoid about this one. Then we’ve got my check up plus his first round of jabs. Not much fun! i could add more things but really that is enough to be getting on with and I want to make sure I get all of it done!